Interstate 26 generally stays west of Columbia, serving commuting interests from Irmo to the northwest and south Lexington County. Interstate 26 angles southeast from Upstate South Carolina to the LowCountry and Atlantic Coastal Plain. The freeway serves Charleston at the eastern terminus, linking it with the capital city and the Greenville/Spartanburg area (in conjunction with Interstate 385). Northward from the Palmetto State, I-26 continues to Hendersonville and Asheville, North Carolina and the Tri-Cities in eastern Tennessee. Outside of the metro areas in South Carolina, I-26 remains rural, generally with four travel lanes. The "Malfunction Junction" area of St. Andrews was slated for a massive overhaul starting in mid-1988 with right of way acquisition as part of a $80-million improvement project. Proposals outlined two new directional ramps from I-26 to Interstate 20, and a collector distributor roadway system northward from I-126 to the St. Andrews Road interchange along I-26.1 Funding for this project however never matriculated. Exit 102 with South Carolina 60 (Lake Murray Boulevard) was upgraded from a half diamond to a six-ramp parclo interchange during work between March 3, 19974 and late 1999. 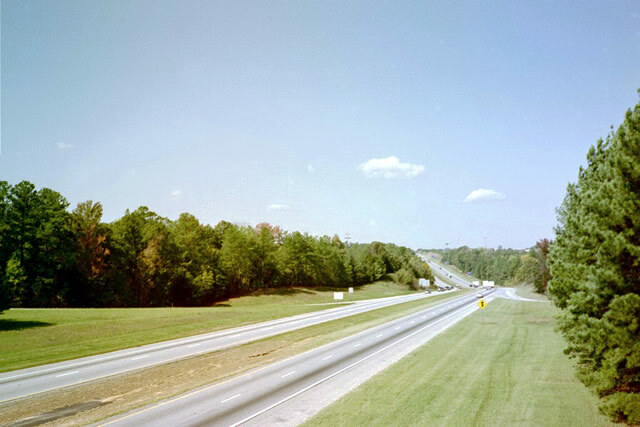 This construction followed an expansion of I-26 from four to six lanes between Harbison Boulevard and U.S. 176 (Ballentine exit) in December 1993. Looking northwest at Interstate 26 from the South Carolina 72 overpass at Exit 54. A second Clinton area diamond interchange lies a short distance to the north at South Carolina 56 (Exit 52). Photo taken October 15, 2001. Montague Avenue meets Interstate 26 just south of the exchange with Interstate 526 in the city of North Charleston. The east-west arterial connects the freeway with a number of shopping centers and an outlet mall. Pictured here is the eight lane overpass above I-26 and approach to the westbound on-ramp. Photo taken 06/01/07. Montague Avenue eastbound at the westbound on-ramp to Interstate 26 to Columbia. Ahead is the intersection with Mall Drive and Goer Street. Goer Street acts as a frontage road for Interstate 26 to the south while Mall Drive encircles the Charles Towne Square retail complex. This I-26 shield and guide sign assembly was subsequently knocked down and removed. Photo taken 06/01/07. An Interstate 26 trailblazer directs drivers along Commerce Drive as it merges with the off-ramp from I-26 west within the diamond interchange at Exit 113. Photo taken 08/05/00. Commerce Drive and the off-ramp at Exit 113 continue to meet South Carolina 302 (Airport Boulevard) at a signalized intersection. S.C. 302 travels a short distance east to end at U.S. 21-176-321 (Charleston Highway). This assembly was removed and a new set of shields were posted for S.C. 302 across Airport Boulevard. Photo taken 08/05/00. St. Andrews Road west at the loop ramp onto Interstate 26 east outside Columbia. I-26 proceeds south directly to "Malfunction Junction" with Interstate 20. Photos taken 06/01/07. Eastbound South Carolina 72 meets Interstate 26 at a diamond interchange outside Clinton. The westbound ramp sees two control cities due to the nearby split of I-26 west with Interstate 385 north to Greenville. Photo taken 10/15/01. Former sign assembly posted along U.S. 29 north ahead of its full cloverleaf interchange with Interstate 26 near Hadden Crossroads. Interstate 26 travels between the cities of Asheville, North Carolina, 60 miles to the north, and Columbia, 80 miles to the south. Photo taken 12/08/99. "MAJOR CHANGES FOR 'JUNCTION' PLANNED." The State (Columbia, SC), December 11, 1987. "I-26 ROADWORK WINDING DOWN - CONSTRUCTION SHOULD BE DONE BY JULY 4." The State (Columbia, SC), June 7, 1993. "Malfunction Junction gets initial go-ahead - I-26, I-20." The State (Columbia, SC), February 18, 2011. "WORK ON INTERCHANGE MAY BE TRAFFIC-STOPPER." The State (Columbia, SC), February 27, 1997.